ICSF Gala raises over $3.6M for Catholic Education, breaks record. Published 4/12/2019. Local. BOSTON -- Business leaders, educators, parents, clergy members and college presidents -- all gathered together on Apr 4 at the Boston Marriott in Copley Square for one common purpose: supporting Catholic education in the Archdiocese of Boston. This year's 29th Annual Inner City Scholarship Fund (ICSF) Gala began with a series of students proudly clad in their school's uniforms showcased their talents. Some schools brought their latest STEM projects; others brought their visual masterpieces. One school sang and played music as guests mingled during the cocktail hour. As the evening's program began, Bishop Peter Uglietto, Vicar General and Moderator of the Curia for the Archdiocese of Boston led the audience in prayer. The bishop explained that Cardinal Seán P. O'Malley had been called to Rome, but had asked him to represent him at the event and deliver the invocation. "Because of your generous support, children and families have the opportunity to receive a superior education and the personal and spiritual formation support that will allow them to achieve their God-given potential and success in life," Bishop Uglietto said. The evening continued as Amanda Mena, a sophomore at St. Mary's High School in Lynn and a 2018 "America's Got Talent" semi-finalist, treated the guests to a vocal performance featuring songs by Loren Allred and Whitney Houston. "I'm honored to be invited here by the Catholic Schools Foundation," Mena said. "Your organization reflects so much of what I believe in: quality education, achievement, good character. I, along with my friends at St. Mary's, are so lucky to have this support, allowing us to avoid the wrong crowd and succeed. Following the dinner service, student speaker Julian Delgado, a senior at St. John's Prep in Danvers, addressed the crowd. "It is an honor to be here with you to express the gratitude I have for the Catholic Schools Foundation,' he began. "Not only did you make my Catholic education possible, you made my college dreams a reality." "And the best part? I am just one of 4,000 lives you have changed," he added. Delgado went on to describe life growing up in Lawrence, where poverty, hunger and violence were the norm. He praised his mother who sought a way for Delgado to escape that life. That way turned out to be Bellesini Academy, an all-boys Catholic school in Lawrence. "Like always, it turns out my mom was right when she told me Bellesini was the opportunity I needed," he stated. After graduating from Bellesini Academy, Delgado was given a four-year scholarship to St. John's Prep in Danvers. "It was a complete reality shock. I was actually the minority. I have always been Latino, obviously, and of lower socioeconomic status, but so was everyone else in Lawrence," Delgado said. "Now I was one of only a few who were either Latino or of lower socioeconomic status." "St. John's was where I learned how to embrace who I am and how to make an impact because of who I am," he added. Delgado concluded his remarks announcing that after being accepted to over 10 colleges and universities, he has chosen to attend the College of the Holy Cross in Worcester this coming fall. Following Delgado's remarks, Jim Judge, President and CEO of Eversource Energy and chair of the gala, presented the audience with the results of the gala's fundraising efforts. "With my financial background, I'm used to focusing on the bottom line. So I'll start with a few noteworthy numbers," stated Judge. He noted that the event's fundraising goal was $3 million. "With all your help and generosity, I am thrilled to report that we've exceeded that target by 20 percent -- raising just under $3.6 million tonight," he said, adding that if the event reaches the $3.6 million mark, it would be the "highest fundraising level in the long history of this event." The Catholic Schools Foundation later confirmed that total raised at the gala surpassed $3.6 million, breaking the record for the event. 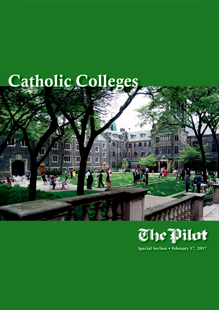 Judge noted that 4,000 scholarships were awarded last year to 84 area Catholic schools. He also noted that 98 percent of scholarship recipients go on to attend college. "Sure, financial assistance is certainly critical for these students," Judge said, "but a scholarship means so much more to them personally, as well. It's a vote of confidence from others that can mean the world to these students." Judge then introduced Peter Lynch, who was instrumental in the creation of the Catholic Schools Foundation. "Peter's unparalleled business success with Fidelity Investments is nothing short of legendary," Judge said, "But in my view, what Peter has done for Inner-City Scholarship Fund may be his greatest legacy." Lynch introduced the Carolyn and Peter Lynch Award recipient, Richard Connolly, private wealth manager at Morgan Stanley and the Connolly Group. "For many of us in this room, our Catholic education played an important role in shaping our lives," Connolly said. "It is both a privilege and an obligation to pay it forward." Connolly went on to praise the teachers and school leaders, as well as the parents who sacrifice to bring Catholic education to these students. "Together, we are a partnership: teachers, parents, and all faith communities working together in the formation of our children," he said.